Taking the classic deer cartridge up a tier in effectiveness. 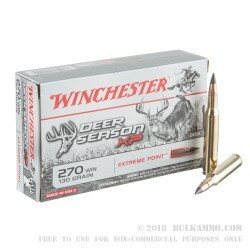 This .270 Winchester load by Winchester, in the “Deer Season” line, makes it actually capable of taking even larger game, like elk, etc. 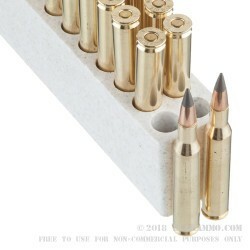 The extremely high ballistic number son this cartridge make it a very good choice for general hunting purposes, extending the potential for the .270 in the field. A polymer tipped 130 grain XP (Extreme Point) can get you up to about 3050 feet per second velocity and 2700 ft. lbs. of energy at the muzzle is at the extreme end of the .270 spectrum and can be a perfect choice for an unpredictable season, or for when you aren’t able to outfit a new rifle before you have your tag pulled for bigger game. 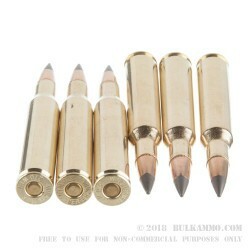 Don’t forget that this round is made by one of the best rifle cartridge manufacturers in the world. That counts for something too. The ballistics aren’t the only selling feature. How about near perfect reliability through incredible factory quality control or the Boxer Primed premium brass that makes handloading some hunting rounds more easily done in your off time. The clean consistency of this round is exceptional. 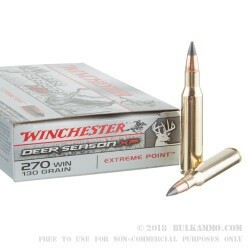 Suitable for usage in all .270 Winchester rifles.